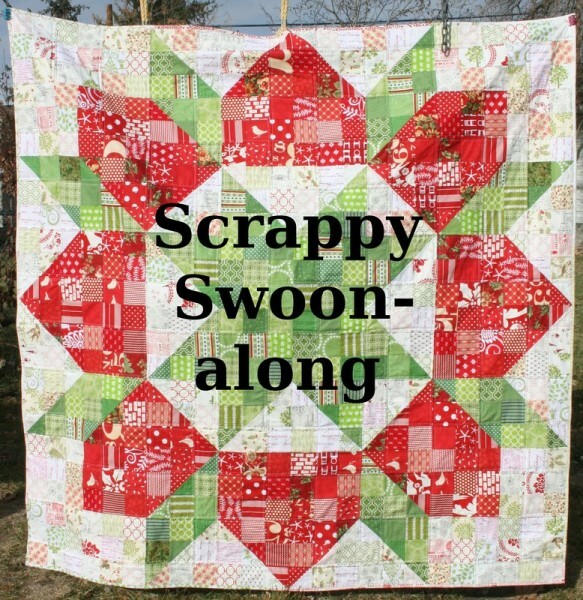 I am so excited to announce the Scrappy Swoon Quilt Along! Inspired by Camille Roskelley’s Swoon pattern, this quilt is one Swoon block enlarged to 72 inches square and made from scraps. It’s a lot of piecing, but it’s really very simple to make; all squares and half square triangles. Once you’ve started it comes together quickly. So raid your stash/scraps and jump in with us! I hope you love making this quilt. Wow! What a beautiful quilt. I stumbled upon this and I must join in. I hope I am not too late to the party. I have a whole drawer of 2 1/2″ squares, so I plan to make mine smaller. I didn’t find the code to add your button to my sidebar. 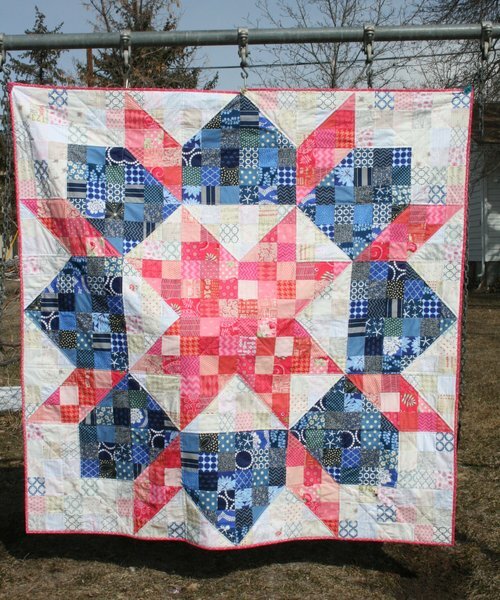 I love this quilt and your blog seems fun. How do I follow you though? I can’t find a follow button! Just wondering about your washing process for a quilt like this, I am assuming you haven’t washed this quilt yet, I was wondering if the red esp. Would bleed on to the whites. Did you prewash fat quarters before? I am in love with this quilt! What a great idea! I just stumbled across it…so I will have to start plotting and pulling fabrics. 🙂 thanks for the great QAL and tutorial. LOVE this! I just came across it when googling the Swoon quilts. I am sad I missed the QAL–but definitely want to give this a try. I signed up to do the Giant Swoon waaaaaay back in January, but have only just finished. I just wanted to share, because I really love my new quilt (top… I’m not that finished 🙂 ). Thank you for organising this. Could I please get added to your emails. I just came across your site and I want to keep updated on the site. It is very interesting. Thank you. Have made one of these tops now have to quilt it. Gave a copy of my pattern to my daughter and she wants to make one but with slightly different colors then mine. I used only red print material left over from a red and white and black quilt I made a before and white on white background on hearts with a solid white background. Hi Jennifer, while looking for a tutorial for the Lone Star block, I found your blog. (I am relatively new to patchwork and quilting and do not have a blog…yet). I found your tutorial easy enough to follow and thought yes I really do want to attempt this, until I saw your gorgeous Scrappy Swoon quilt! I know I am 4 years too late for the QAL but I do so want to make it and your tutorials are brilliant! I am a visual learner so was able to follow through all sections. Thank you so much for sharing your beautiful masterpiece! I look forward to making it.